There are so many things to do in Panama and we think we have most of them here! Puerto Lindo is a sleepy Caribbean village set in the Portobelo National Park with excellent links for boat travel to San Blas and Colombia. Because of our fantastic location, there is so much to see and do in our area that it’s difficult to know where to start. Panama is known for the amazing bird watching opportunities, but there’s plenty of other wildlife to explore off the coast and in the jungle. 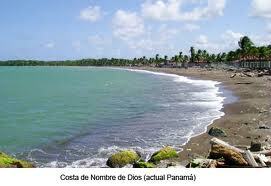 Alternatively, get involved in the history of Panama by visiting the previously pirate infested towns nearby. If adventure is more your thing, horse riding, zip lining, surfing, kayaking, snorkeling, diving and fishing are also available. The information has been split into sections to help you plan your visit with us more easily, but please contact us with any questions. We are incredibly lucky to have an excellent dive school 200m from our hostel which offers PADI courses of all levels in the beautiful waters around the local Islands. They also offer non-certified diving options, skin diving and snorkeling. Please email us at info@hostelwunderbar.com for further details and to make a booking. Wind your way through the amazing mangroves and stop off at Panamarina for a glass of wine or some excellent French cuisine. Continue to Isla Marmay before heading back in these superior ocean kayaks. Kayak availability is limited so please let us know as soon as possible if you want to hire these. There is great snorkeling around the coral reefs and mangroves off the local Islands of Isla Marmay and Isla Grande. Rent a kayak or catch a water taxi to get you there. (See the ‘Island’ section for details on how to do this.) You can also take your mask down to the bay close by and jump straight in!If you need to rent snorkel equipment, please drop us an email at info@hostelwunderbar.com and we can reserve this for you. 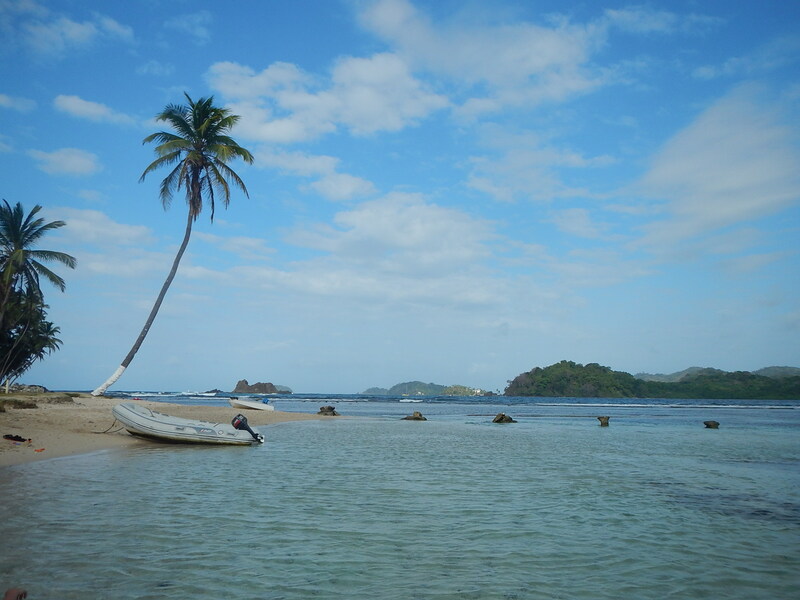 There are some great (and almost deserted) surf spots at Cacique and Isla Grande. 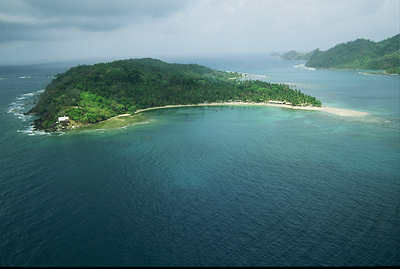 Cacique breaks left on a not too shallow reef bordering a small Island close to the main land and is usually deserted. Isla Grande is very fun due to its strong medium sized waves. It has 3 different peaks, 1 left peak, 1 left or right and 1 right peak all on crystal clear water where you can see the reef while you surf. This wave is recommended for intermediate to experienced surfers. There is no option to hire surf boards here so please bring them with you. We can store them at the hostel for you. Our beautiful hostel has several very easy and accessible walks close by. authentic village of Cacique. You’re likely to see a wealth of birds, butterflies, geckos and monkeys. Turn right out of the hostel, right again onto the dirt road and right where the track forks. With breathtaking panoramas of the bays below, this walk is definitely one where you will need your camera! The abundance of plant life here is wonderful and you will see many plants used for local foods and medicines. Get off the tourist trail with this unique experience that will take you rock hopping down the beautiful Caribbean coast, through coconut plantations and up to breath taking vistas before reaching the deserted white sandy beach of Playa Blanca where we swim in the crystal clear lagoon and eat lunch before heading back. Panama outdoor adventures who have offices in Rio Piedra in the provinces of Colon offer various types of outdoor adventure activity including zip lining and river tubing. 9 cables are offered at this exciting and beautiful venue. Call on (+507) 6605-8171 (+507) 6605-8171 for further details. Our beautiful jungle surroundings can also be explored by horse back where prices start from $35. Please email us at info@hostelwunderbar.com for further details. There are 12 beautiful Islands off the coast of Puerto Lindo with deserted white sandy beaches to explore. The most popular local islands are Isla Marmay and Isla Grande. Isla Marmay is a beautiful Caribbean Island with beautiful snorkeling and some good surfing between November and May. Place your towels on the green grassy area lined with palm trees or bring a hammock and chill in the sun. There are no restaurants on Marmay so please bring enough food, drink and suncream for your visit. Water taxis can be taken from Puerto Lindo for around $6 per person ($3 one way). Very popular with Panamanians on the weekend, this beautiful Island has 1 public and 1 hotel (pay for entry) beach and plenty of restaurants and bars for you to relax in. Take a boat from Puerto Lindo for $5 per person one way or catch the bus the 6km to La Guaira and catch a taxi boat from there for around $2.50 one way. Today Portobelo is a small port town (you can see everything in a couple of hours), but its history is rich with pirates, plunder and adventure and the ruins here are a legacy of its dark past. 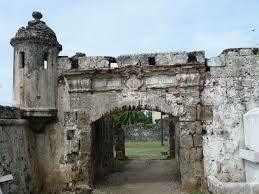 Portobelo was christened by Christopher Columbus in 1502 and means ‘beautiful port’ in Italian. When Francis Drake died he was dumped in the sea at Drakes Rock in a lead coffin. While here you should visit the forts of Santiago and Geronimo, the customs house and the Black Christ Church and museum. This beautiful town has a river winding through it on its way to the ocean. It also boasts one of the quietest (and therefore usually cleanest) black beaches in the area. This town also has a rich history of exploration, conquest and settlement. 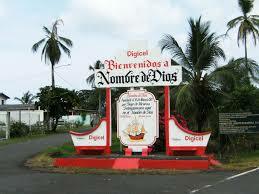 Peruvian silver was taken to Nombre de Dios for shipment to Havana making it an irresistible target for pirates. In 1572 Francis Drake sacked the town and ambushed the silver train. He captured the town again in 1595, but with less success and missed the 5 million pesos which was waiting off the Pacific side of Panama. We are incredibly lucky to have some excellent (and cheap) local woman who create delicious home made dishes and serve them straight from their kitchens. Options include fresh seafood, soups, roast chicken, burgers and traditional Caribbean dishes. 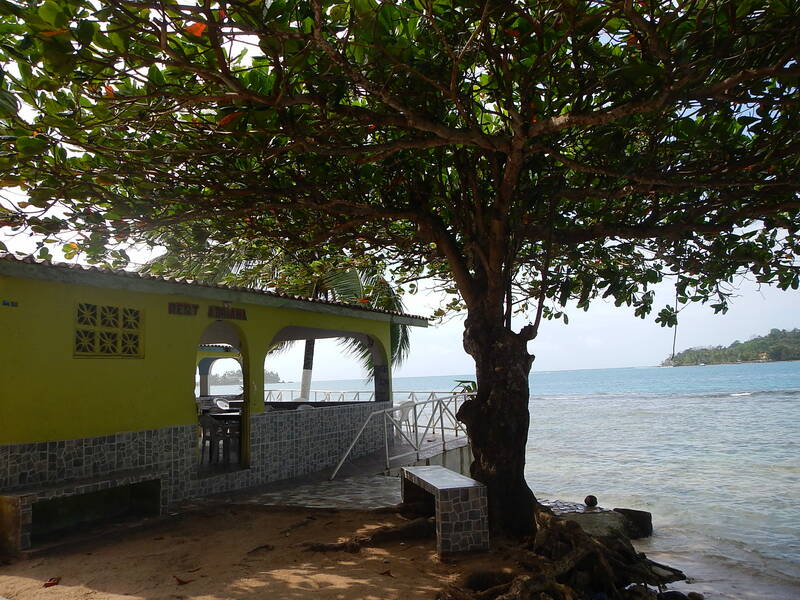 This Colombian kitchen serves excellent seafood, meat and vegetarian options and is about 300 meters away from the hostel overlooking the bay of Puerto Lindo. Perfect for watching the sail boats come and go. You can reach this delicious French restaurant from the water or the dirt road in the direction of Cacique. Rent the kayak and go through the mangroves or take a gentle walk, hire our bikes or drive the 4km. 5km in the direction of La Guaira, Adriana’s offers excellent fresh seafood. Turn left just before you reach La Guaira. Italian restaurant, 2 km in the direction of Portobelo on the left side. They can usually pick you up if you want a glass of wine!